[FTC Disclosure] This is NOT a sponsored post. 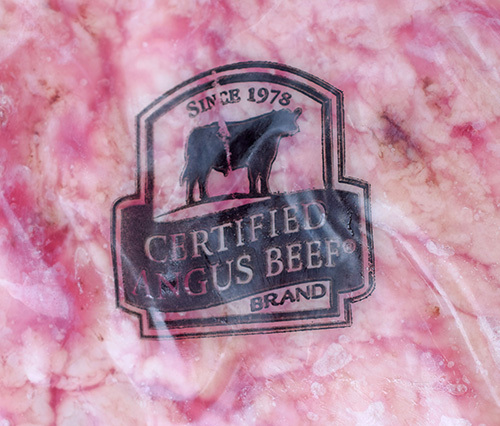 However, we are sponsored by the Certified Angus Beef® Brand. We have personal relationships with the owners/operators of Flame Boss, Kick Ash Basket, and Albukirky Seasonings. Brisket is my strongest category at KCBS BBQ competitions. We aren't a team competing at 20+ events a year, but we almost always get a Top 10 "call" in the brisket category. 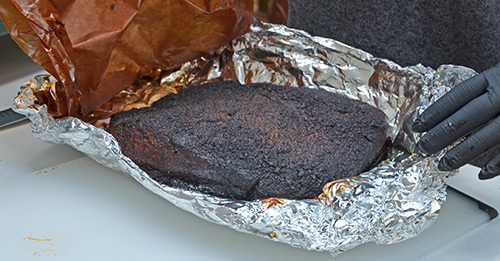 This isn't the only way to cook a competition brisket, but it is what works for us. We now use a Deep South Smoker GC36 for competitions and large cooks, but this is how we do the brisket on kamados using the same process. Timing is critical because I like to wet age my briskets for 28 to 32 days before smoking them. The average time that beef wet ages before selling in retail is 12.7 days, so I typically need to wet age my briskets for about another 15 to 19 days. I always ask my butcher for the harvest date to be sure. 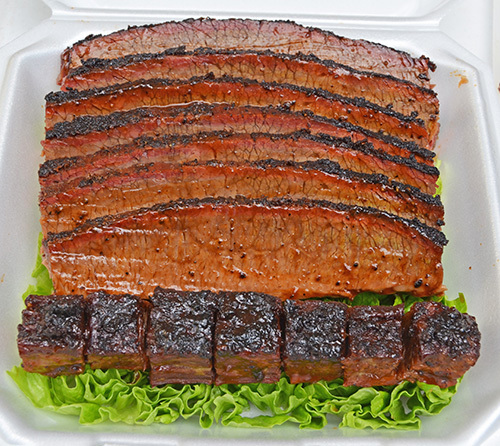 My go-to brisket is a 16-18 pound Certified Angus Beef® Brand brisket. If I can't get Certified Angus, then I look for a USDA prime brisket. I used to use wagyu brisket, but I found that we scored better with the CAB briskets. The easiest way to find a quality brisket is to start with this logo. Has a flat that is flexible. Has a large, bulbous point. I don't stress over getting a left-handed brisket versus a right-handed one. 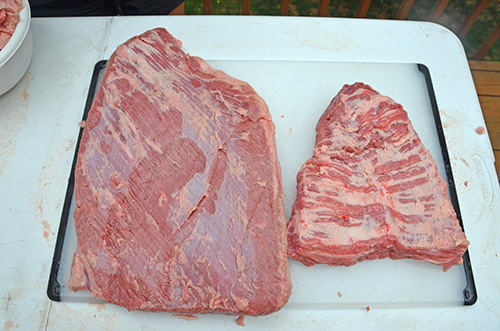 For competitions, I buy 2 briskets - one with a nicer flat and one that has a nicer point. At home that isn't necessary, I'm just trying to maximize my advantages for competitions. 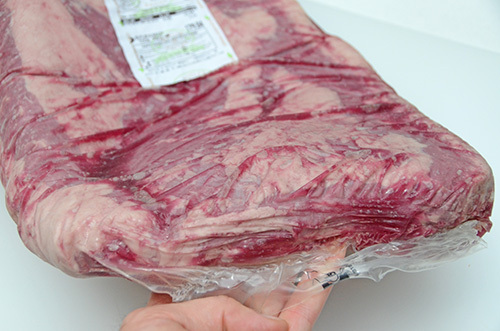 A whole brisket shown in the Cryovac® bag. The flat is on top and to the right. The point is on the bottom and left side of this picture. Checking to see how flexible the flat is and whether or not it has a thick, even flat. A few days before the contest we trim the meat and make our injections, rubs, and finishing sauces. This gives the injection a few days to get the air bubbles out and makes Friday at the contest site much easier. 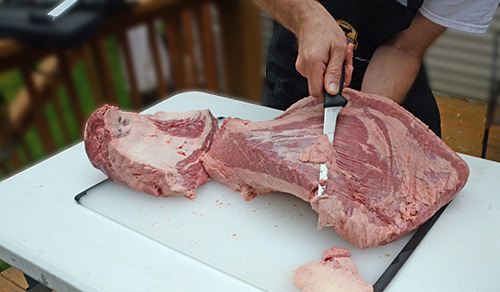 The brisket is comprised of the deep pectoral (flat) and superficial pectoral (point) muscles. We separate these for competition cooks because I think it makes the brisket cook faster, more evenly, and it provides bark on 100% of the point for burnt ends. I cut the one with the nicer point just the way David does in the video, trimming the full point off all of the way. For the brisket with the nicer flat, I stop short about 3 inches under the flat, leaving a good portion of the point on the flat. This protects the most critical part of the flat, the part where I'll take the slices for my turn in box. 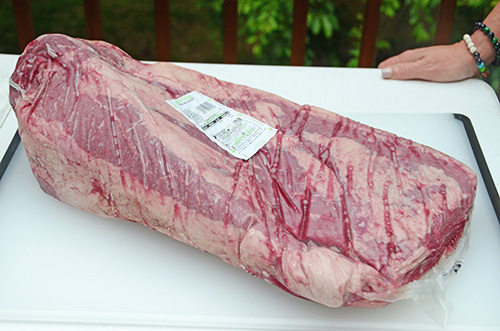 This is a 15.84 pound Certified Angus Beef® Brand brisket. 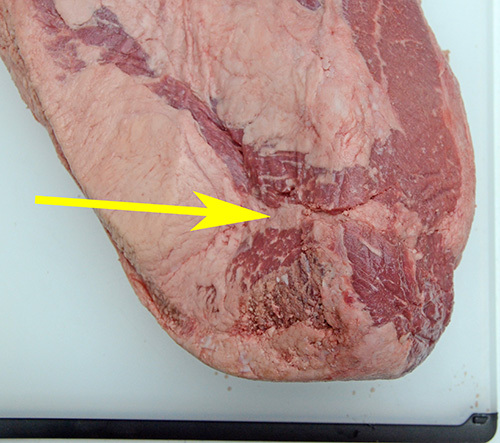 To separate the brisket point and flat, find the fat seam between the point and the "nose" of the brisket. Use a sharp boning knife and start slicing down through the fat seam while simultaneously pulling up/back on the nose of the flat. Then turn the blade back and follow the fat seam between the two muscle groups. 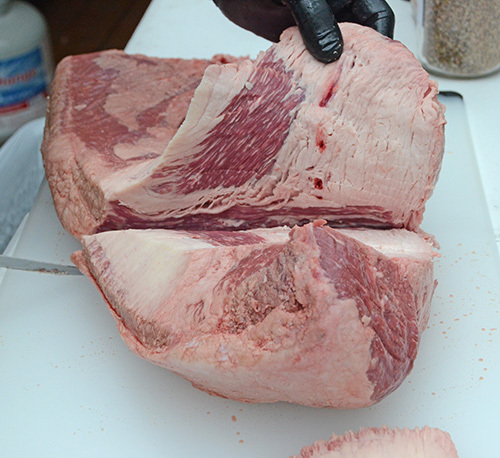 I cut this brisket point short, just turning the blade downward and slicing through the rest of the point. 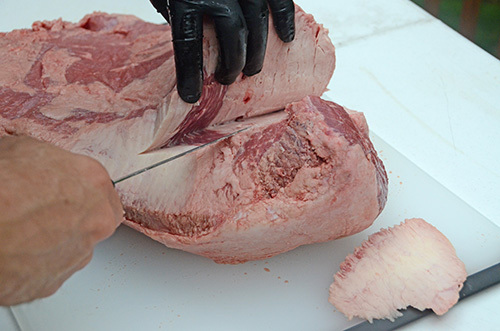 To trim the top of the flat, hold the brisket up with your free hand so that the brisket bends like this. That makes slicing off the fat/silverskin easier and makes it less likely that you'll gouge too deeply into the good meat. The opposite side of the flat is the "fat cap." Common practice is to trim this to 1/4" thickness, but I've moved away from that and go for an aerodynamic shape instead. This does two things. 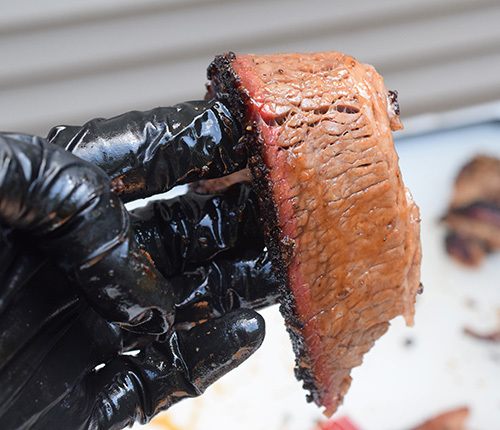 It lets the smoke flow evenly over the brisket, and it avoids any low spots where juices can pool up, leaving a light spot in the bark. To do this, after trimming the fat off of the top side, flip the flat over with the fat cap facing up. 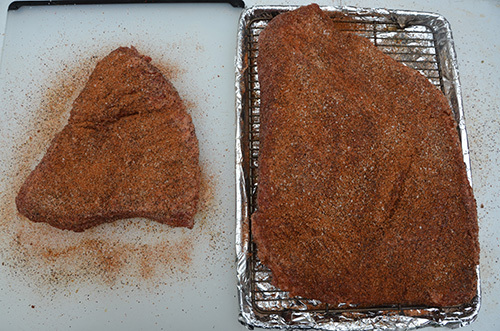 Start slicing off the high spots and level out the surface until you have a smooth brisket. When you flip it back over to cook, the flat top will be nice and even. There is a ton of fat to trim off of the point. Just be patient and keep trimming off the surface fat, slicing perpendicular to the grain of the meat. Trimmed and ready. I don't try to get down between the grain of the meat on the point, just the fat that sticks above the surface of the meat. At this point, you can't do anything else to the brisket until after the official meat inspection on Friday. So we double bag the brisket and point in 18" x 24"2-gallon food bags for storage until then. 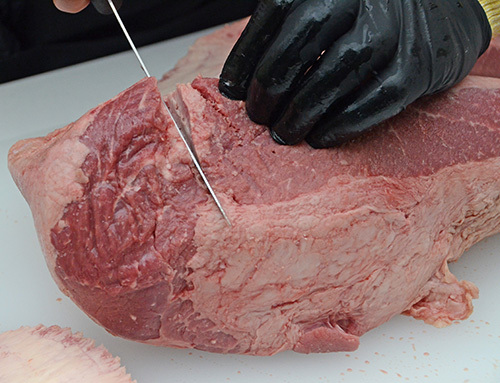 Most pro teams use a commercial beef injection that boosts flavor, bolsters tenderness, and helps it retain moisture. Xanthan gum as a thickener to help emulsify the injection and to help it stay inside of the meat when injected. You can probably find it in the organic, gluten-free, or health food section of larger grocery stores. When making injections, I make a point to use distilled water to keep out things in tap water that can affect the mixture. We do a blend of two commercial injections, mixed according to their directions and then add in 1/2 teaspoon of xanthan gum. For home, you can just use 2 cups of beef stock simmered for 10 minutes, then thickened with xanthan gum and cooled. 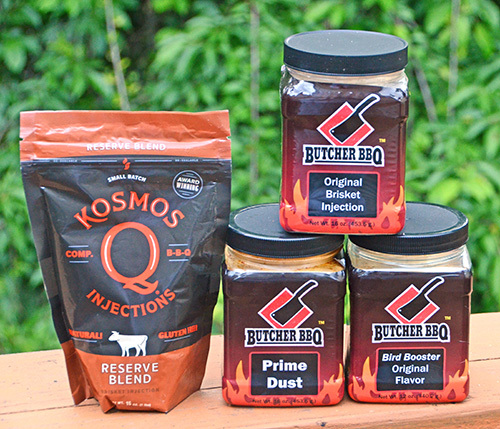 We use either Butcher's Prime Dust and Original Brisket mixed together, or Kosmos Reserve Blend and Prime Dust mixed together. The ratio is 1 part Prime, 3 parts the other. We use 2 rubs for seasoning. 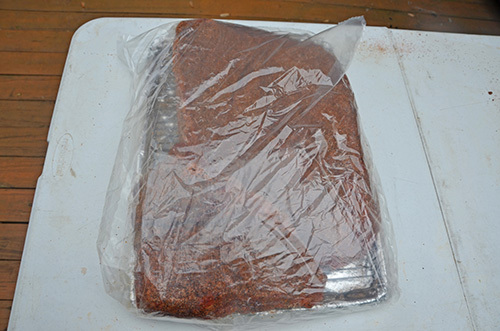 We use our NMT Beef Rub v.2 recipe for the base seasoning. 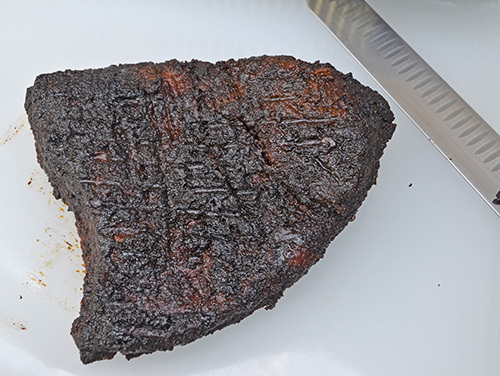 The salt/pepper/garlic base gives it a classic beef rub flavor, the chiles give it a little kick, and the shallot and bell pepper enhance the taste of the brisket. The second rub is a commercial rub used by a lot of pro teams - Smoking Guns Hot. It is premade, but you need to take about 1/4 cup of it and finely grind it into dust using a pepper mill or coffee grinder for the finishing seasoning. 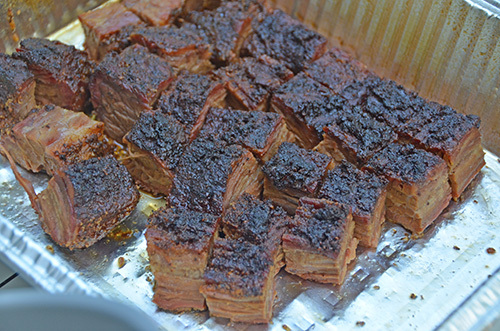 I typically don't sauce brisket at home, but for competitions, it is necessary to keep the slices from drying out while waiting for judging and to add another level of taste. Our sauce for burnt ends is 1 cup Head Country Original mixed with 1 cup of Albukirky's Duke City Sweet. That mixture thinned with the au jus from the burnt ends is our glaze for slices. 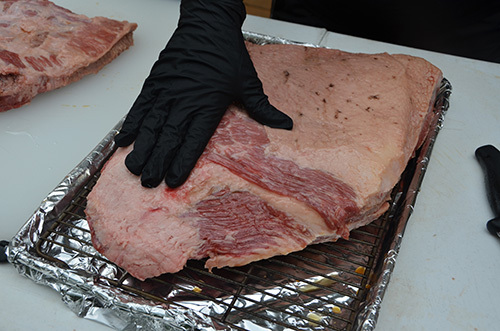 Once the contest officials have conducted your meat inspection (and fire marshal inspection, if necessary) and given you the all clear, you can start seasoning your brisket. We like to do this 12 hours before the meat hitting the smoke. For injecting, I prefer open-ended hypodermic needles (pictured right) versus the closed end needle on the left. 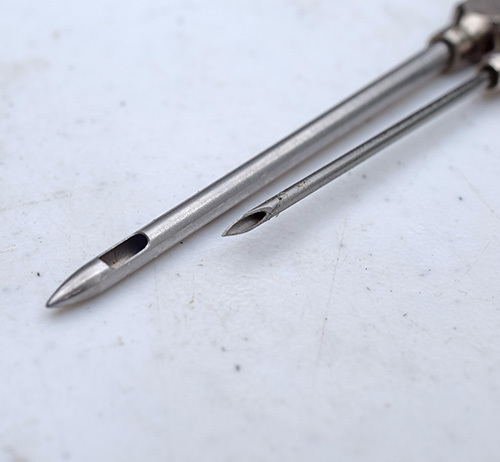 Open-ended needles can be a smaller gauge, which leaves smaller holes in the beef resulting in less injection mix leaking back out. Their downside is that the tip is easily bent and they clog easier. Inject the mix in a grid pattern with injection points about 1" apart. Inject with the grain of the meat. We inject about 5 ml in each spot. 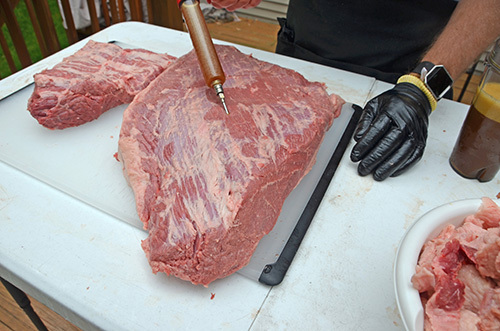 Wipe off any excess injection mix and then lightly coat the brisket with peanut or avocado oil. Apply the NMT Beef Rub v.2 recipe heavily but evenly. 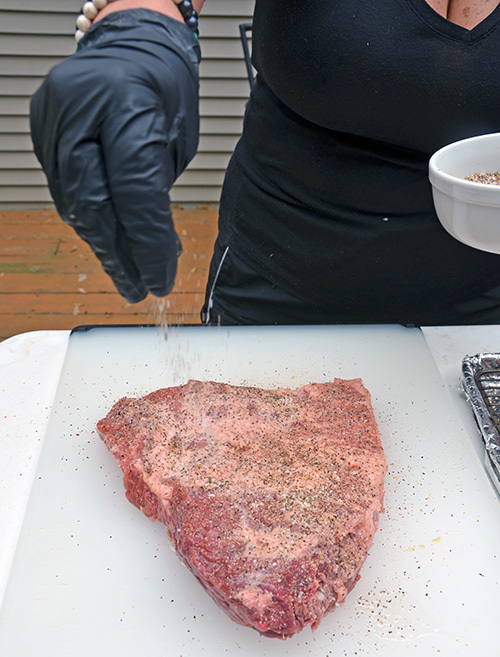 Holding the seasoning hand high up over the beef makes it less likely to clump up. Adam Perry Lang calls this "season like rain." Then apply a moderate coat of Smoking Guns Hot on top of that. Now re-bag the brisket point and flat and keep refrigerated until 2 in the morning. We also try to get making our turn-in boxes out of the way on Friday. 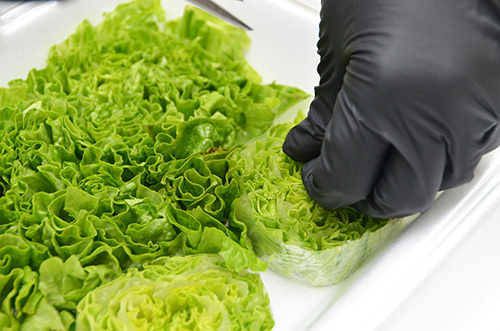 We wrap green leaf lettuce in plastic wrap and slice it into 3/4 to 1" medallions. 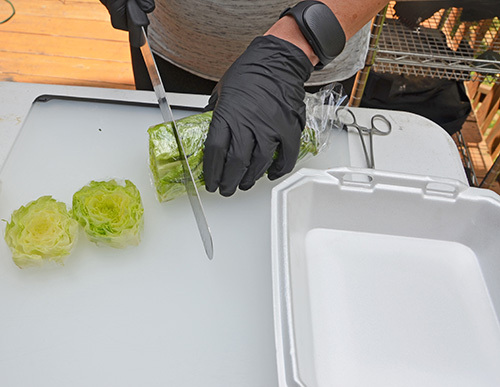 Place 5 of the medallions in the tray and then carefully remove the plastic wrap. This will let the medallions expand and fill the base of the tray. Just be sure to get all of the plastic out, or you could be disqualified for "marking" your box. We also set up our smoker(s) Friday afternoon, so when it's time to light up in the middle of the night, it is just torch and go. 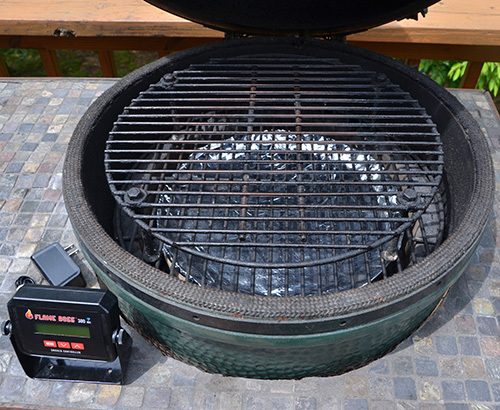 The triangle fire set up is the best configuration we have found for getting good smoke on a brisket in a kamado grill. 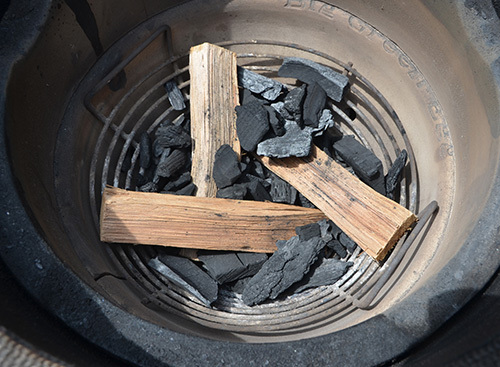 Angle the three hickory or oak wood splits like this and then carefully fill in any voids under them with hardwood lump charcoal. 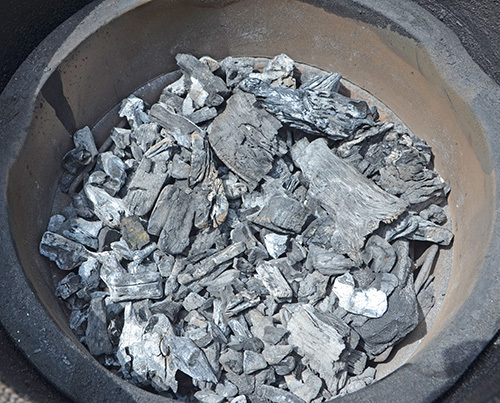 We use the Kick Ash Basket in all of our kamado grills. One reason is for better airflow. But the necessary reason at competitions is that our kamados run until 1:30pm, and we want to be loaded up by awards ceremony at 4pm. Just shutting down a kamado will leave it too hot for hours to move and set up with rubber pads for transporting them. 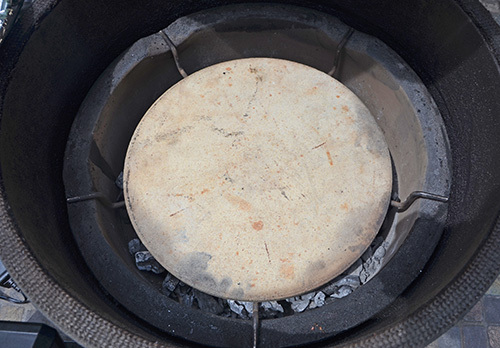 With the baskets, we just remove the coal as soon as we are finished with a kamado and it will start cooling right away. Once we have the triangle set up built, we top it off with hardwood lump charcoal. Here I am re-using coal on top, but in competition, I would only use brand new coal. I'm not a coal snob about brands. We like Parkers Charcoal because it's a Tennessee product and we get it locally. 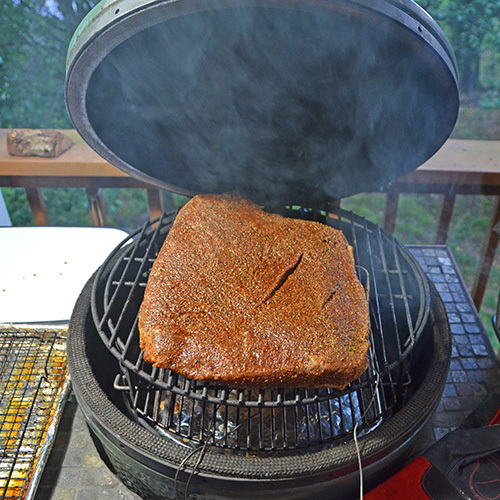 But we also like Kamado Joe Big Block, especially when using our Deep South Smoker. Rockwood Coal is also a good one, but it has gotten pricey around here. Royal Oak is fine too. My favorite trick for brisket (or ribs) on the kamado is using an oval ceramic stone heat deflector. 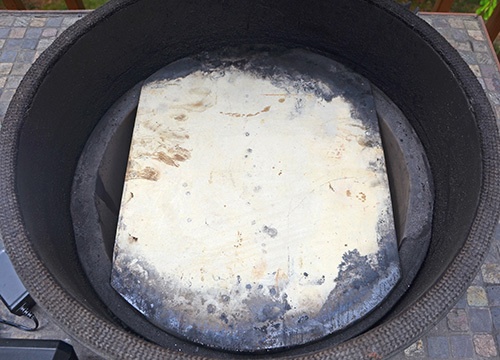 With a plate setter (aka Conveggtor) or pizza stone, there are air gaps where the ends of your brisket can be over direct heat, cooking faster than the rest of your brisket/ribs. The oval stone prevents that by having no openings at the ends. 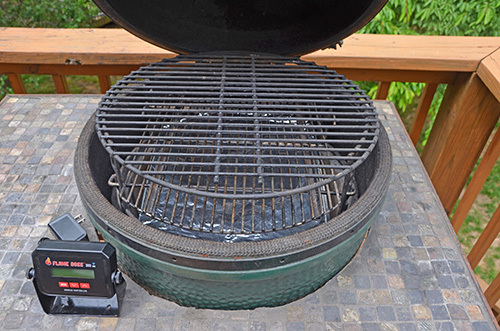 To cook the brisket and point, you will need a 2 rack system. My go-to set up for this is an adjustable rig since they go with the oval heat deflector. You can also use a plate setter. Here I have the plate setter "legs up" and on top of that, a drip pan, then the OEM Big Green Egg grate and finally, a homemade raised grate. You can also use a stone/spider combo. 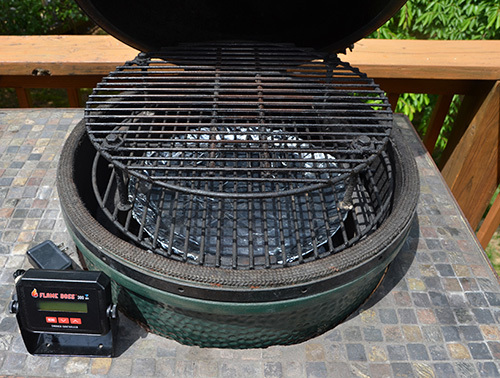 Here is a spider, stone, drip pan, OEM BGE grate, and homemade raised grate set up. For this one, I put the point on the bottom, so it is fully protected. The flat goes up top where there is at least some distance anywhere that there are air gaps below. Competition day is finally here! We light our smoker at midnight and let it preheat to 290°f. Easier Start-Up - Most of the time in a contest you are multi-tasking. Is easy to be side-tracked and then overshoot your cooking temps. Using a controller lets you focus on other things. Temperature Control - Things can get crazy during the witching hours of a contest, especially if you are running 4 kamado grills like we did. 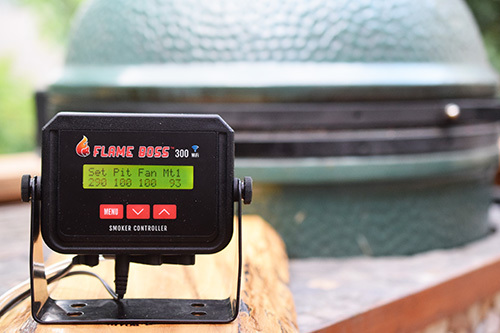 The Flame Boss keeps track of our fire and maintains the correct temperature, even when we are distracted elsewhere. Better Smoke - The forced air not only maintains the heat, but it also creates a modest convective effect. Moving smoke is better than still smoke 10 out of 10 times. Lessons Learned - The unit creates a data log of times, cooking temps, internal temps, and run times. This data lets us learn from our past cooks. The Flame Boss 300 has WiFi capabilities, so your smartphone can monitor AND control your fire from anywhere on Earth with Internet access. 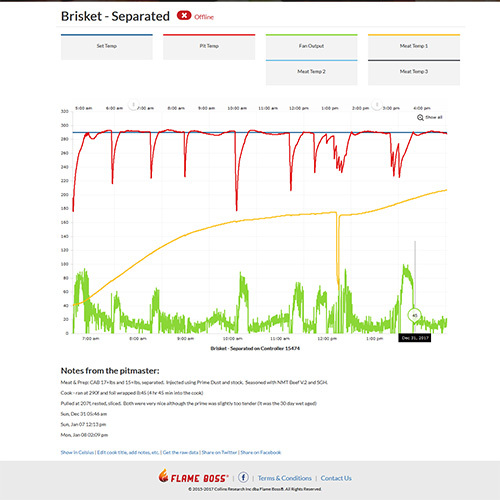 You can utilize the data from your brisket cooks to compare and learn about how your cooker does, how the beef reacts, and the timing that works for you. Brisket hits the smoker at 2am. We keep it cold until it is time to go on the smoker. Insert the temperature probe into the thickest part of the flat, with the grain of the meat when possible. Then we spritz it with quality apple juice and do that every hour until we wrap around 6am. We run it at 290°f the whole time. Like the majority of pro teams, we wrap our competition briskets. To determine WHEN to wrap, we go by color. Brisket about 3 hours into the cook. It looks pretty, but you want much darker than this. 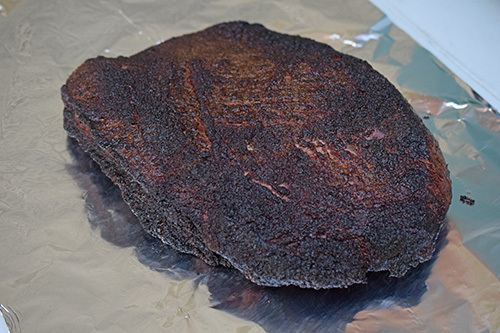 We wrap the brisket when it becomes almost black all over. This is typically around an internal temperature of 160-165°f when using our gravity fed smoker or offset pits. But kamados don't burn as much wood, and as a result, you have to go to an internal temp of around 175-180°f to get the color you want before wrapping. The next question is what to wrap with. 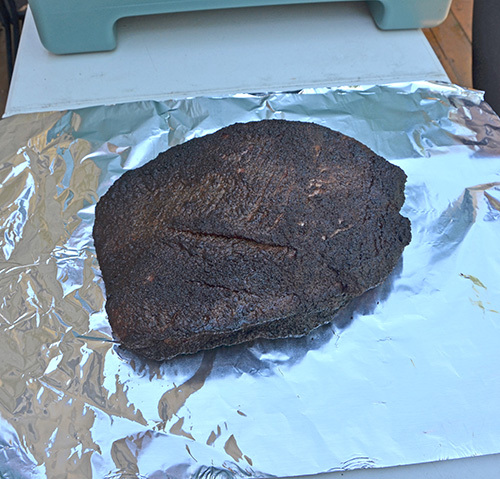 Foil - If the brisket seems to be running slow, behind schedule, I will fully wrap it with two 18" x 24" foil sheets. 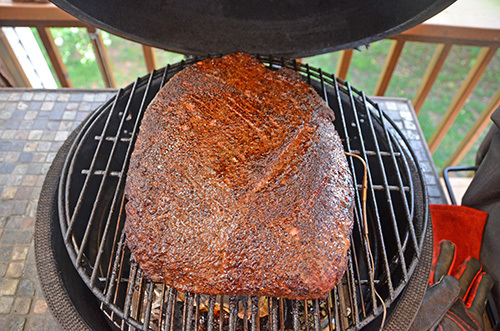 This will cook the brisket faster while keeping it juicy, but your bark will get soggy. 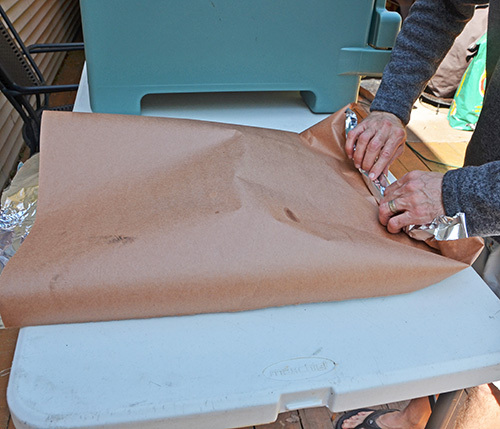 Paper - If the brisket seems to be running on time, I use a combination of foil and butcher paper. I stole this idea from our friend, Moe Cason. I use foil on the bottom, which retains juices for my beef jus and butcher paper on top which lets the brisket continue to breathe. I place two 12" x 18" sheets of foil on the table. Then goes the brisket and on top of that, a 12" x 18" sheet of pink butcher paper. I sprinkle a little dehydrated shallot or onion below and on top of each flat and give them one last spritz before sealing. 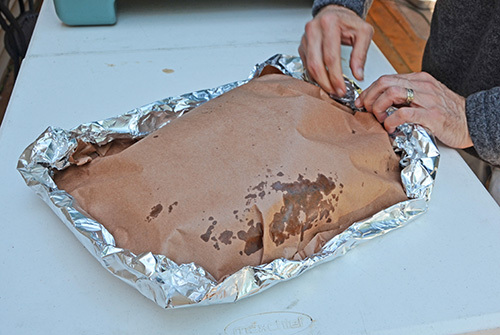 Then I roll up the edges to make seams, sandwiching the brisket between the foil and paper. Now it goes back into the smoker until done. 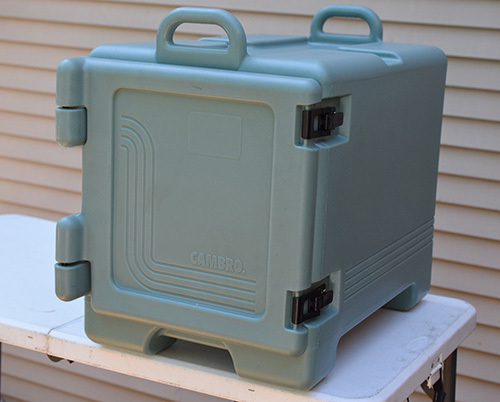 Around dawn, we preheat a Cambro UPC300 hot box by placing a pot of boiling water in a steam pan. At home, you can warm a small-ish cooler instead. Starting around 9am, I start watching the temps of the points and flats. The point is much smaller and should be done faster than the brisket. 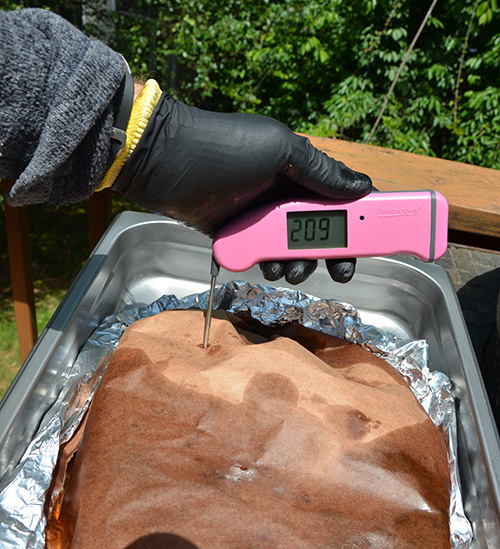 It is done when it is above 200°f, and it is tender as butter when you stick with a Thermapen probe. 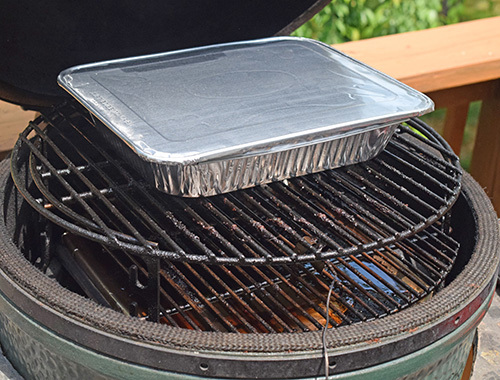 I wrap the points in a single 12" x 18" sheet of foil and place them in the Cambro to hold until we make burnt ends. Around 10:45am, we make the burnt ends. 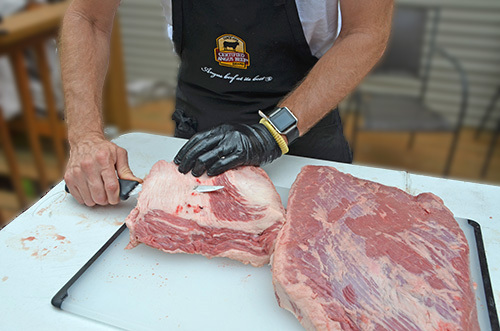 I take the point out of the wrap and use a Victorinox butcher knife or Victorinox slicer to cut the brisket into 1" cubes. We place the cubes in a half-sized steam pan and add beef stock until it comes 2/3rds the way up the sides of the cubes. We seal this with foil lids. The pan of burnt ends go back onto the smoker at 11am and stay until 12:15pm. We rely on Thermoworks products for both remote probe and instant-read thermometers. We prefer them for their speed and accuracy. 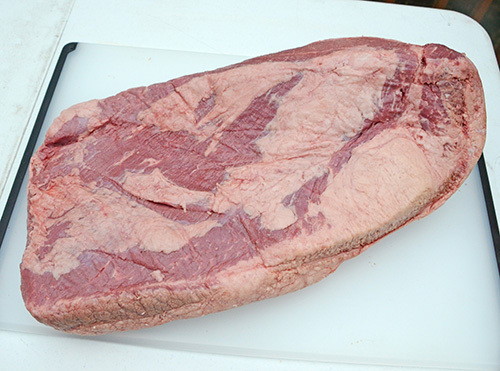 The brisket flat is done when it is above 200°f, AND it is probe tender. Typically this is over 205°f, and I have seen it go as high as 211°f. 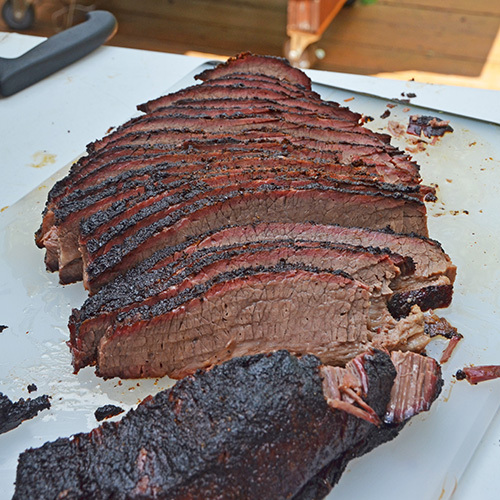 For this particular brisket 209° was the magic number. When the flats are done, put them in the Cambro until it is time to slice. At 12:30pm I put the burn end sauce on the grill or on a burner to warm up. If it has been more than an hour since the flats came off the smoker, I put them back in the smoker. At the same time, I finish the burnt ends. 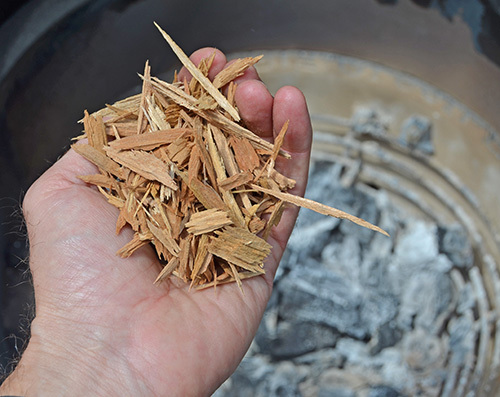 We need one last kiss of smoke, so I add a cup or so of dry wood chips to the coals. This is quick, and the fire is almost spent, so I don't bother putting the heat deflector back in. Pour the liquid from the burnt ends pan into a fat separator. 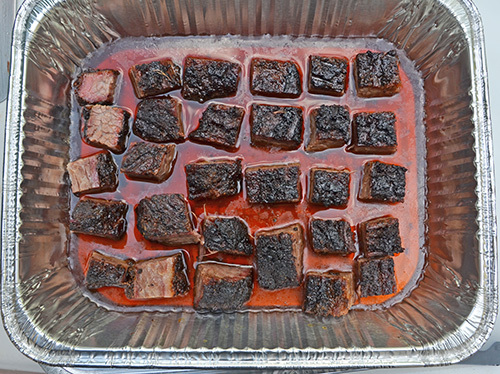 Burnt ends after straining off the jus. 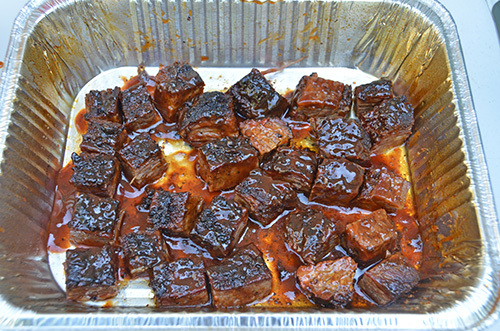 Brush the burnt ends with 1 cup of the burnt end sauce (saving the other half for slices). Put these back on the smoker for 10 minutes to absorb one last dose of smoke. You've now turned in your chicken, ribs, and pork. 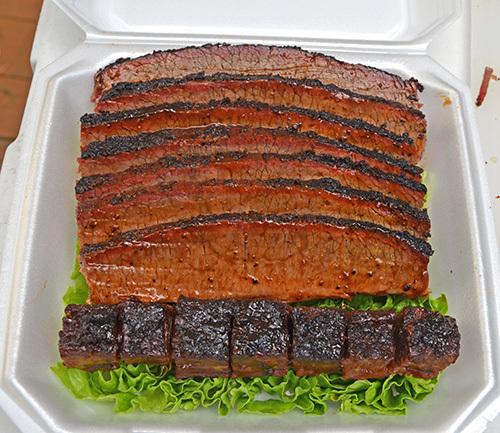 You're exhausted, it's hot, but you're on the final stretch, and it's time to box up your brisket. Make the glaze for the sauce. 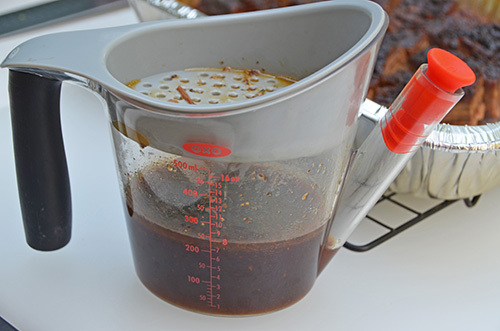 Thin 1/2 cup of the burnt end sauce with 1/4 to 1/2 cup of the jus reserved from the burnt end pan. Slice both flats. Start with 1 slice against the grain of the meat close to the sweet spot - where the point and flat overlapped. If it is perfect texture, slice pencil width slices. If slightly tight, slice them thinner than that. If over one and trying to fall apart, slice a bit thicker than pencil width. Keep the slices pressed together, so they don't dry out. Tenderness - Which one is more relaxed? Which one loops over a finger, completely limp? Which one stretches juuuuuust the right amount and then snaps? Taste - Which one tastes better? Taste straight and taste it with a little of the glaze on it. How much extra seasoning will they need when boxed up? Do they need sweet, pepper, salt, and/or heat? Pick the best flat and slice it up. Draping a slice across your finger is a good way to determine tenderness. Pick the best 7 slices (6 judges plus the table captain - that way the last judge to pick stick gets to pick their slice). Hold the slices together and slice the edges off, just to the width of your turn in box. Trim off the bottom piece of fat from each slice. Glaze each slice with the sauce/jus mixture. At 1:25pm I build the box. Typically I layer the slices in the back and put the burnt ends up front. For the slices, make sure the slices are oriented in the same direction. If one slice gets flipped 180° horizontally, it will look slightly "off" instead of all the pieces having the same slight contour. For the burnt ends, I try to pick the 7 most similar sized pieces. Add your final seasoning, based on the tasting you did. Whatever you add needs to be extra finely ground for the maximum impact and best presentation. 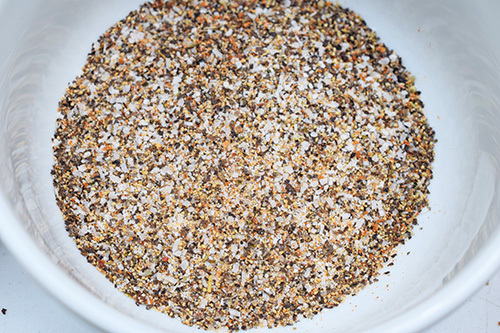 If it just needs salt or black pepper, I add some of our finely ground NMT Beef Rub v.2. If it needs heat, I'll dust it with a light amount of cayenne pepper through a fine mesh sieve. Double check for any plastic or other "marking" issues. Wipe off any sauce on the inside of the box. Hand it to your runner. Breathe a sigh of relief and enjoy a nice cold beverage. I hope this helps you create competition style BBQ brisket at home. If you have any questions, let me know, and I'll try to help you out.